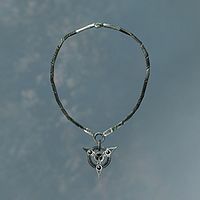 Wearing the Amulet of Articulation allows you to automatically succeed at all persuasion checks in the game regardless of skill. The amulet also increases the Speech skill by its listed "articulation" value, but because you pass all persuasion checks anyway, this only improves buying and selling prices. The armor rating does improve with a higher Light Armor skill. Getting hit while wearing it may increase the Light Armor skill. It does not interfere with the Mage Armor, Custom Fit/Well Fitted, or either of the Matching Set perks; however, unlike a shield, it will benefit from the two Light Armor perks. There are seven different versions of the Amulet of Articulation that you can receive (and an eighth version that is NPC-specific), each with a different strength enchantment. The intent was probably for the version received to be level-dependent, but instead it is random. All seven versions are equally likely at all levels. You can get the highest one by repeatedly loading a save and talking to Brynjolf, though it may take some time. This issue has been addressed by version 1.1 of the Unofficial Skyrim Patch; The progression has been corrected as follows: PC level 1/8/15/22/29/36/43. The displayed enchantment magnitudes and the actual enchantment magnitudes do not match. This issue has been addressed by version 1.3.3 of the Unofficial Skyrim Patch; the enchantment magnitudes have been adjusted to match the descriptions.